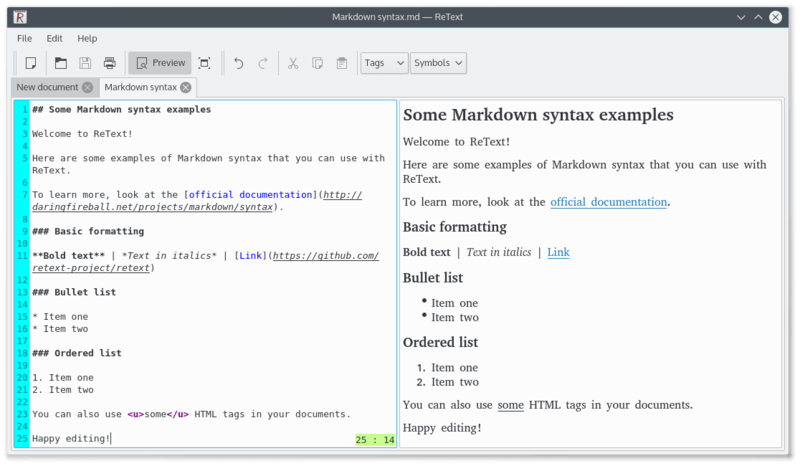 In this article, we shall review some of the best Markdown editors you can install and use on your Linux desktop. 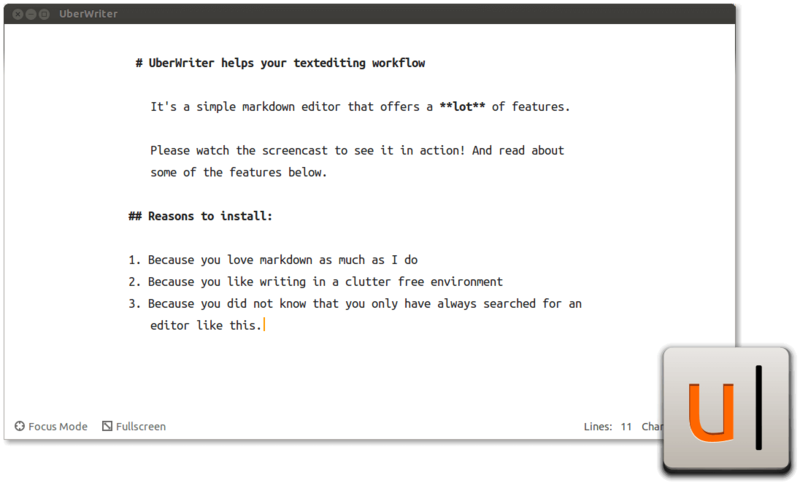 There are numerous Markdown editors you can find for Linux but here, we want to unveil possibly the best you may choose to work with. For starters, Markdown is a simple and lightweight tool written in Perl, that enables users to write plain text format and covert it to valid HTML (or XHTML). It is literally an easy-to-read, easy-to-write plain text language and a software tool for text-to-HTML conversion. Hoping that you have a slight understanding of what Markdown is, let us proceed to list the editors. Atom is a modern, cross-platform, open-source and very powerful text editor that can work on Linux, Windows and Mac OS X operating systems. Users can customize it down to its base, minus altering any configuration files. 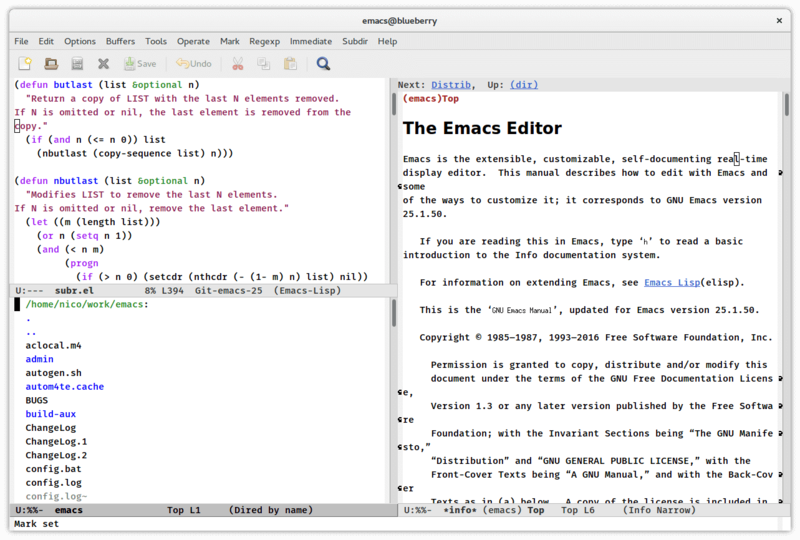 Emacs is one of the popular open-source text editors you can find on the Linux platform today. It is a great editor for Markdown language, which is highly extensible and customizable. 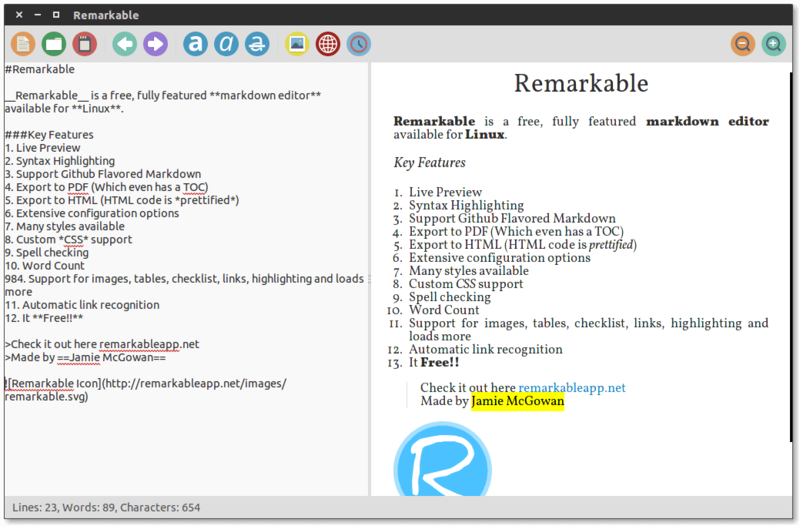 Remarkable is possibly the best Markdown editor you can find on Linux, it also works on Windows operating system. It is indeed a remarkable and fully featured Markdown editor that offers users some exciting features. 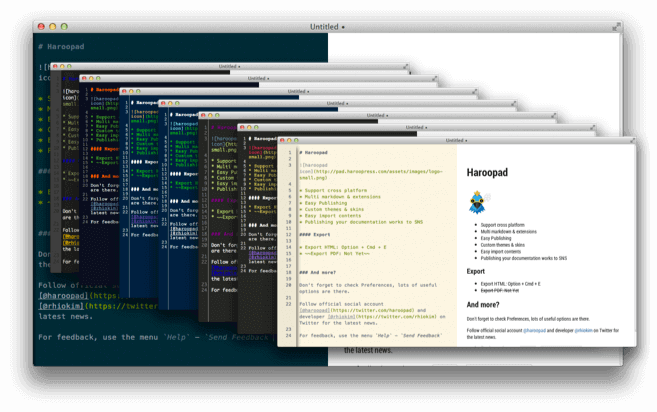 Haroopad is an extensively built, cross-platform Markdown document processor for Linux, Windows and Mac OS X. It enables users to write expert-level documents of numerous formats including email, reports, blogs, presentations, blog posts and many more. 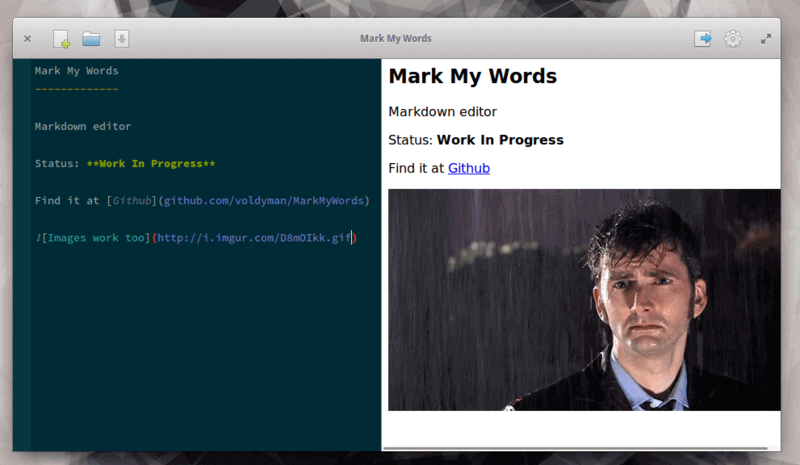 Mark My Words is a also lightweight yet powerful Markdown editor. It’s a relatively new editor, therefore offers a handful of features including syntax highlighting, simple and intuitive GUI. Vim is a powerful, popular and open-source text editor for Linux that has stood the test of time. It is great for coding purposes. It is also highly pluggable to enable users add several other functionalities to it, including Markdown preview. There are multiple Vim Markdown preview plugins, but you can use Vim-Instant-Markdown which offers the best performance. Brackets is a modern, lightweight, open source and also cross-platform text editor. Built specifically for web designing and development purposes. Some of its notable features include: support for inline editors, live preview, preprocessor support and many more. It is also highly extensible through plugins and you can use the Bracket-MarkdownPreview plugin to write and preview Markdown documents. SublimeText-Markdown plugin is a package that supports syntax highlighting and comes with some good color schemes. Having walked through the list above, you probably know what Markdown editors and document processors to download and install on your Linux desktop for now. Note that what we consider to be the best here may reasonably not be the best for you, therefore, you can reveal to us exciting Markdown editors that you think are missing in the list and have earned the right to be mentioned here by sharing your thoughts via the feedback section below. I have played with ReText, Remarkable and Haroopad. They are all fine, as long as your document remains simple. Once you try to do complex documents, they are not so good. For example, all of them choke, to a greater or lesser extent, in literal text (i.e. within two instances of triple back-quotes) embedded in itemized lists, in the sense that they interpret characters that they should not – e.g. the # character as the start of a section. None of them perform as well as the Github Markdown tools. I also tried with Atom – I couldn’t even get it to work. Actually, None of these are markdown editors, they are all more or less **pure text editors** with a **markdown preview**. Don’t get me wrong, Some of these are GREAT text editors, but they aren’t MD editors. Thank you. These are exactly my thoughts. I also would have liked to see which ones were based on Electron (and/or the language used). Imagine text-editing a simple file and having to wait an entire minute to load the “editor” and using 1gb RAM in the process. I love all of them, they have beautifully designed user interfaces, are easy to use and have special features, but I use Caret most of the time, it is being developed and updated regularly and simply fits all my writing needs. Many thanks for the useful feedback. Consider MindForger – it is more than just Markdown editor, it is Markdown IDE. With MindForger you can edit multiple documents, perform refactoring/cloning/extraction of sections, use document/section templates and more. Many thanks for mentioning MindForger. We will check it out. why every editor’s screen shot has a different gtk/qt and icon theme? It won’t give the idea of the editor’s default look. For example remarkable has a numix icon theme I guess. We have taken note of your concern, we will use default software settings for any future reviews. Many thanks for the feedback. I find Typora very good. Oh, we’ll test it again, but try to use the other editors.